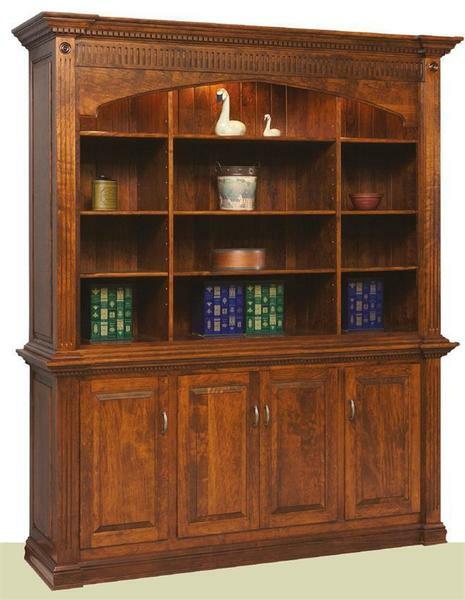 The solid wood Crescent Moon Executive Bookcase is the ultimate display & storage piece for any room of your house. This large 90" high & 75" wide bookcase is sure to provide the storage space you need to organize your home. Select your wood, finish, & hardware for a custom look that will match your home decor and personal style. Also, this handcrafted bookcase comes standard with a 1/4" plywood back, but you can choose to upgrade to a solid wood tongue & groove back for extra support and a more attractive visual appeal. All shelves are solid wood & adjustable for more storage options. Contact one of our friendly furniture specialists for additional information or for custom ordering assistance. Need this bookcase to be wider and taller or maybe just a bit smaller? We can have it built to your exact specifications.